For caregivers and patients alike, ceiling lifts represent a safe solution for transferring from one place to another. At Orthopedic Service Company we work hand in hand with Handicare (formerly Prism Medical) to offer the highest quality, safest and more comfortable ceiling lifts in Cary, North Carolina. Our team of mobility experts will handle all of your doubts, as well as the process of installment, in order to make sure our customers feel as comfortable as possible using this equipment, looking forward to helping reduce the anxiety, uncertainty and discomfort caregivers can face when repositioning or lifting a patient, at the same time as guaranteeing said patient will have a comfortable and safe experience. Our complete line of portable, fixed, free standing and bariatric ceiling lifts in Cary, North Carolina, assures our customers the most comfortable of experiences, making transfers easier for the user and less of a risk to the caregiver in terms of reducing injury. Through Handicare (formerly Prism Medical), you can rely that each lift has been built with the caregiver in mind, meaning our ceiling lift systems require only the minimal effort to be operated. 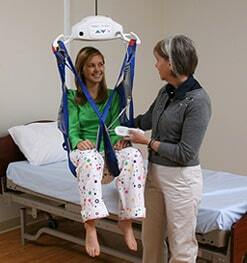 Contact us today for guidance regarding ceiling lifts in Cary, NC.